Buddy Media is out with a new study that examines how marketers are using - and can better use - Twitter as a marketing tool. Between December 11, 2011 and February 23, 2012, the company took a look at how 320 large brands use Twitter. The study examined the Twitter account reply rate, retweet rate and engagement rate defined as a combination of replies and retweets mapped to an accounts number of followers. The study found engagement rates to be 17% higher on Saturdays and Sundays but noted most brands don't tweet on weekends. Adding to that finding, the study revealed which days were best for particular industries. Weekends are best for clothing and fashion (only 12% of tweets occur but engagement rate is 30% higher); Sundays and Monday are best for entertainment (23% higher engagement rate); Saturday is best for publishers (only 7% of tweets occur but engagement rate is 29% higher than average); Weekends are best for sports (while 9% of brands tweet on Saturday, engagement rate is 52% higher on the weekend). 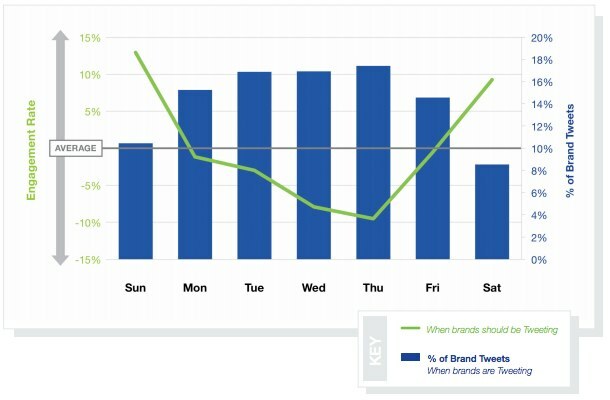 When brands tweet during busy hours, defined as 8AM - 7PM, they receive a 30% higher engagement rate than non-busy hours, defined as 8PM - 7AM. Interestingly, this is directly opposite the engagement rates of Facebook which receives a 17% higher engagement rate during non busy hours. The takeaway her is to stagger Twitter and Facebook maximizing Twitter during busy hours and Facebook during non-busy hours. In terms of the length of a tweet, tweets less than 100 characters receive a 17% higher engagement rate then longer tweets. 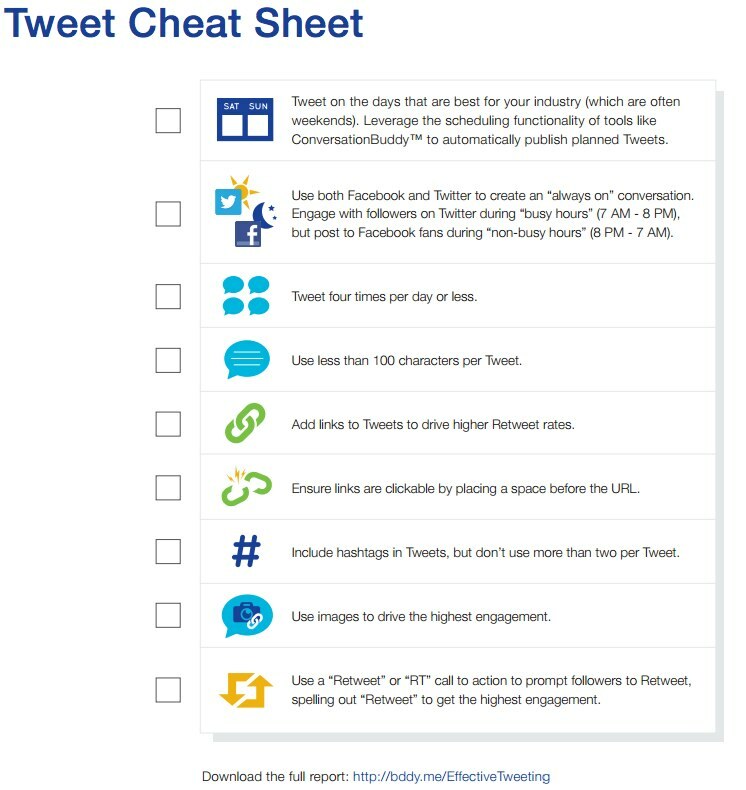 Tweets that contain links receive an 86% higher engagement rate but make sure your links work. 92% of links fail because a space was not inserted before the link. While only 24% of tweets contain hashtags, those that do receive twice the engagement than those that don't. But be sure to limit the usage of hashtags because tweets using more than two showed a 17% decline in engagement. Even though users can't see them without clicking, tweets with links to images garner two times the engagement rate than tweets without links to images. Tweets that ask followers to retweet receive 12 times the retweet rate than tweets that do not ask for a retweet. Most brands ask for retweet using "please RT" but accounts that spell out the word retweet, receive 23 times the engagement rate. 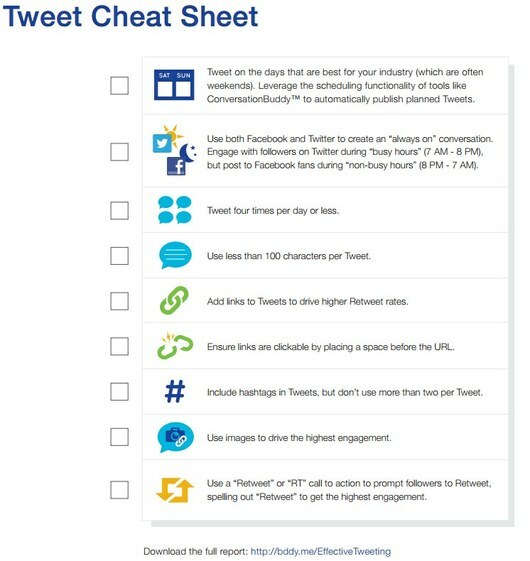 Below is a Tweet Cheat Sheet that neatly places all the findings into actionable steps brands can follow to improve their Twitter ROI. You can download the entire report here.